2013 and 2014 saw the US dollar rebound in a big way from an extended slump against the Japanese yen. 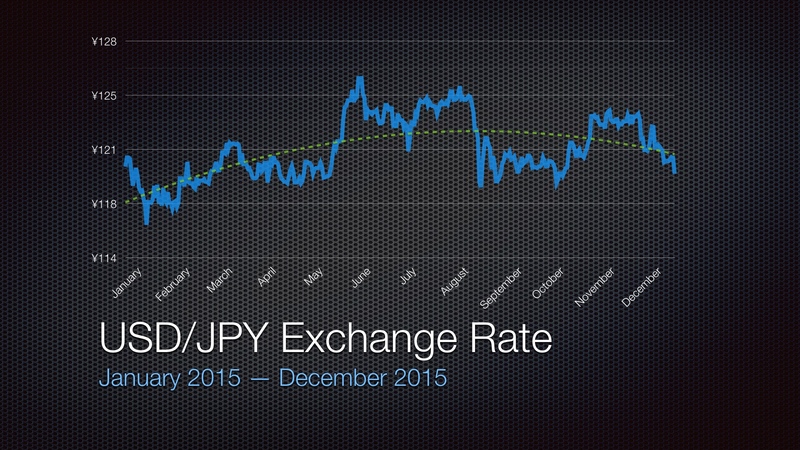 2015 wasn’t nearly as exciting with the USD/JPY index holding pretty steady around ¥120. The dollar hasn’t consistently traded much higher than this in decades, so I think the dollar is in a pretty good spot at the moment. There were only four open orders coming into the year. Two were with Crunchyroll, which requires full payment on preorders, so there were no changes there. Satan’s higher than expected cost can likely be attributed to the heavy decorative base common to all the main-line 7-Sins figures. Sepang Miku, meanwhile, benefitted from economical shipping and my usual conservative estimation. I didn’t do my usual budget outline post at the beginning of the year because there were no significant changes other than a few minor number tweaks compared to the 2014 budget. My rolling budget was $140/month plus the 2014 rollover, while the lump sum budget was $670 plus rollover. 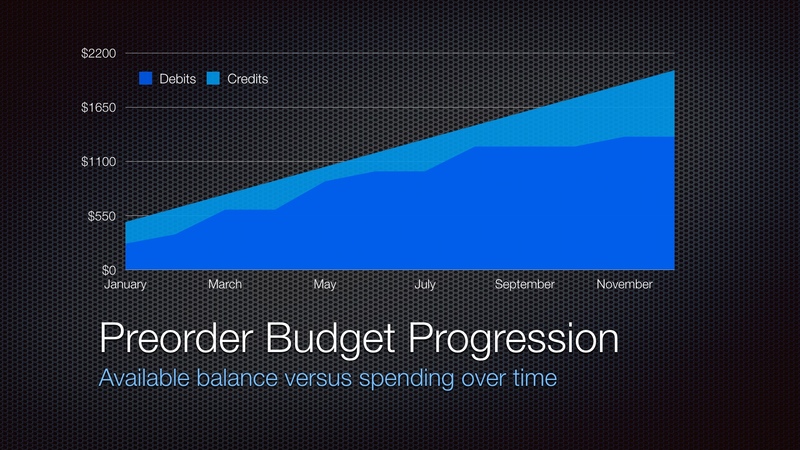 Here’s how the rolling budget was utilized. And here are the same transactions graphed over time. The rolling budget starts off much like prior years with mostly linear progression only to tail off near the end of the year. I’ll explain why when we get to the closing comments section. 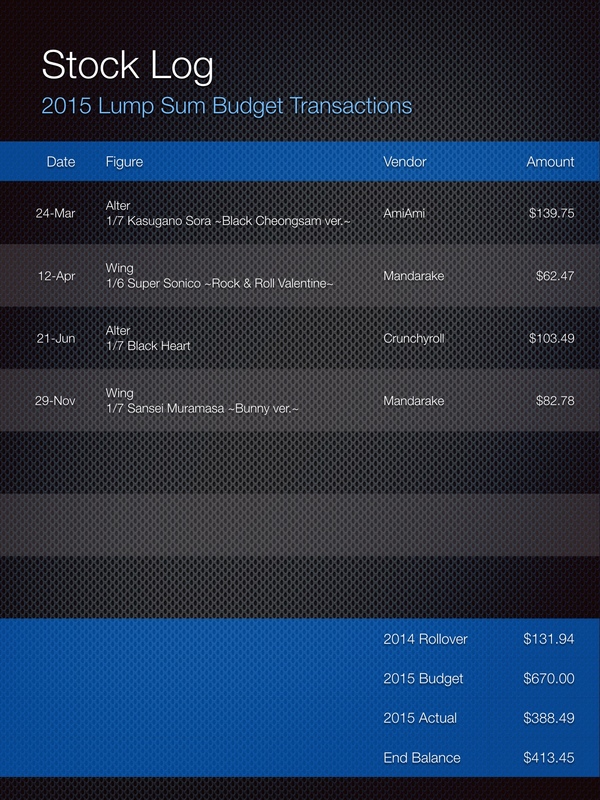 Here’s how the lump sum budget was utilized. 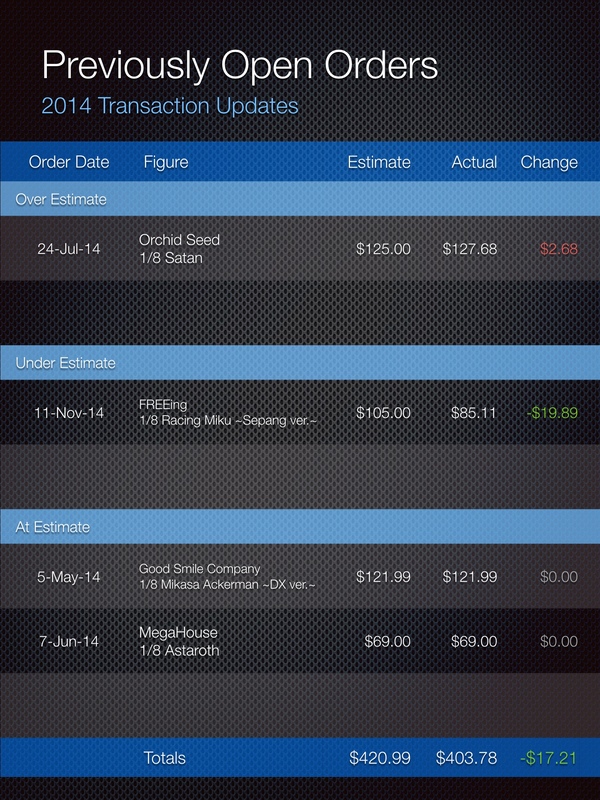 And here’s the same set of transactions over time. 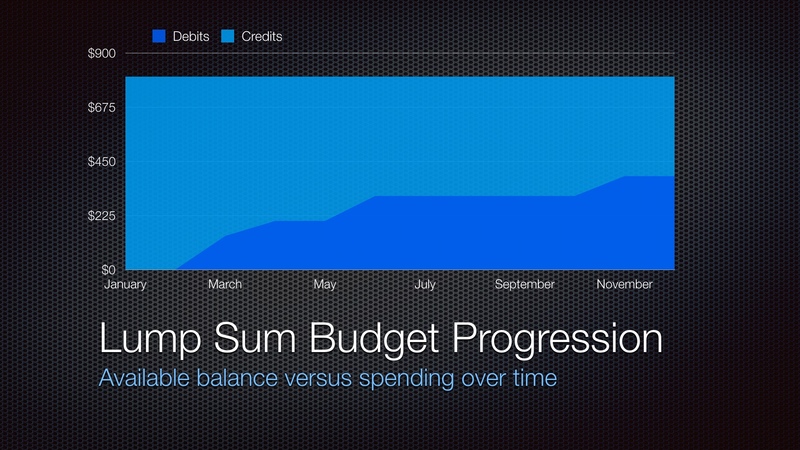 Much as with the rolling budget, the lump sum budget was only lightly utilized this year. More on that in a moment. 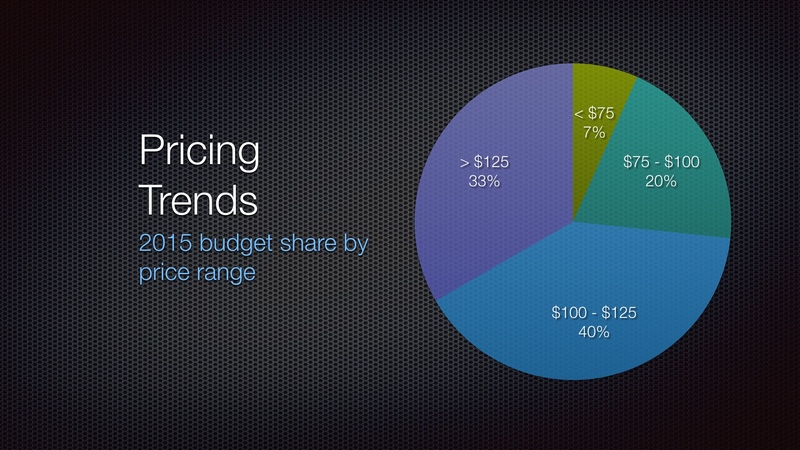 2015 saw a total of 15 new figures across both budgets, down from 24 a year ago. There were eight normal preorders, four exclusives, two secondary market purchases, and one stocked purchase. 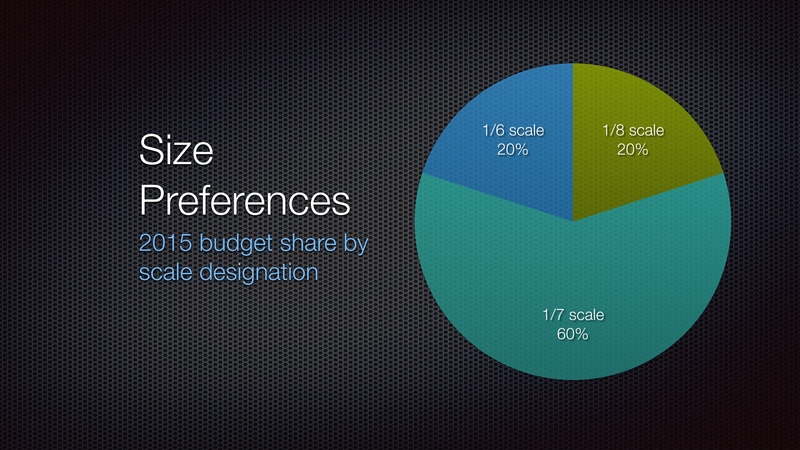 For now, let’s continue with a look at how the budget was used from a few different angles. 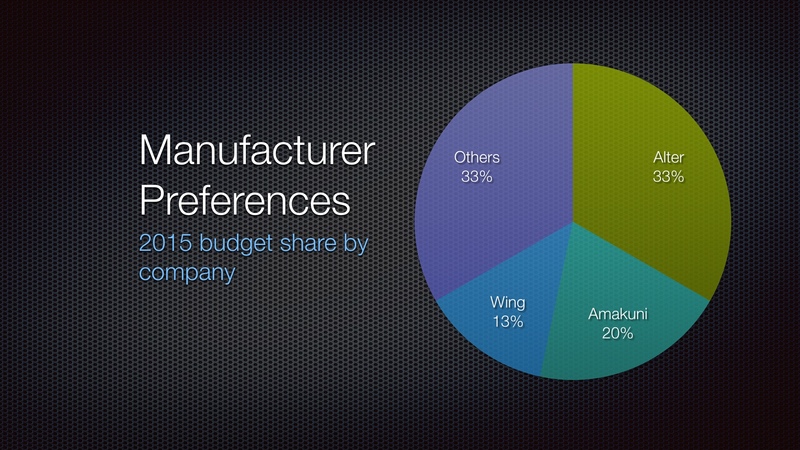 First off, here’s a look at the aggregate budget usage as grouped by manufacturer. Alter accounted for five additions, Amakuni had three, Wing had two, and the rest (Alphamax, Hobby Stock, Kotobukiya, Max Factory, and Vertex) with one each. Alter’s share is pretty much right where they were last year, which shouldn’t surprise as they’ve long been skilled at attracting my eye. I wonder if that trend will continue though, as I feel like Alter hasn’t put out a lot recently that interests me outside of the excellent Hyakka Ryouran lineup. Amakuni is now responsible for the majority of Hobby Japan’s exclusive figure releases, and HJ has historically been relevant to my interests, so a strong showing here isn’t too surprising. One minor quibble: the Hobby Stock-branded Takanashi Rikka figure was actually manufactured by Max Factory, so you could say they accounted for two figures this year (matching Wing at 13% share). And now, let’s look at where I spent my figure dollars this year. AmiAmi and Crunchyroll are pretty much right where they were last year. Nippon-Yasan and Mandarake are my go-to’s for exclusive and used figures, respectively. MHToyShop and CDJapan were the only newcomers for this year, but I don’t expect I’ll be using either again. 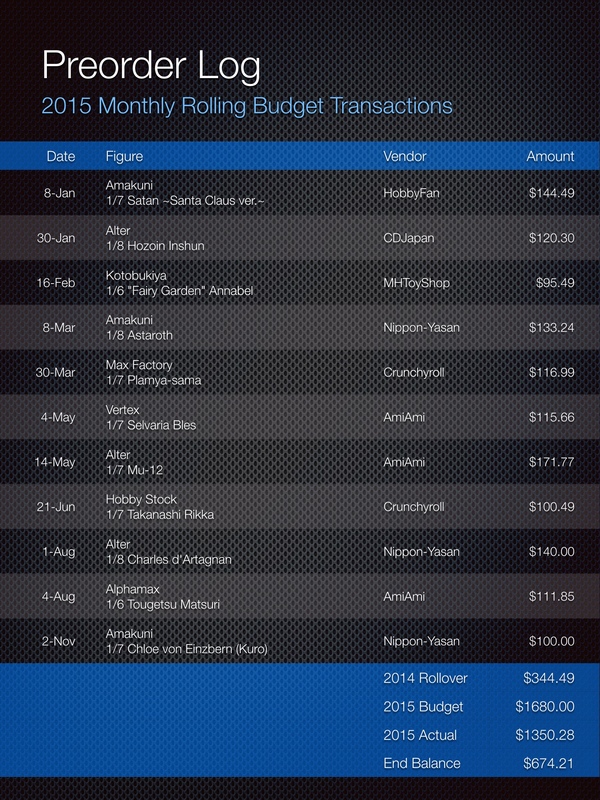 Crunchyroll did several 20-25% off sales this year that were good towards figure preorders. When combined with the standing free shipping for premium members, this seems like a pretty damn good deal. I picked up Rikka and Black Heart during the summer 20% off sale, and by my calculations, both were cheaper than AmiAmi even before taking the free shipping into account, which is pretty impressive. 1/8 scale has been the most common scale for as long as I can remember, so finding that only 20% of my 2015 orders came in at that size is quite a surprise. 1/6 scale is probably my favorite, but there just don’t tend to be that many figures at that size that I want to buy. I won’t complain about seeing more 1/7 scale figures though, especially when some of them feel a good bit larger than that (e.g., Mu-12 & Santa Satan). Figure pricing has trended up in recent years and we see that reflected here, with the top two ranges growing year-over-year from 62% to 73%. The $100-$125 bracket continues to be the largest segment, up 7% over last year, mostly at the expense of the sub-$75 bracket, which has almost disappeared entirely. 2015 was really the year that my storage space caught up with me. Despite adding a couple more bookcases this year, it was readily apparent by the second half of the year that I was running out of space for new figures. I had to become choosier with my purchase decisions and you see that reflected in the relatively low utilization of both budgets. 2016 will see major changes to reflect the situation, but I intend to cover that plan in a follow-up post.